Bucket list alert! You will love Patagonia's wild, rugged and other worldly landscapes. Capture photographs with a pro and take home memories that will last a lifetime. Plus coming eye to eye with a Puma is a peak experience you can't miss! Join renowned South American photographer and nature documentary filmmaker, Ossian Lindholm, in this Travel Vision Photo Journeys exclusive—a Patagonian hiking and photo tour that ranges from Argentina’s spectacular Los Glaciares National Park to Chile’s renowned Torres Del Paine National Park. 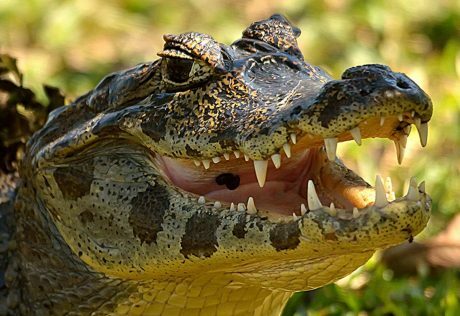 Whether you take hundreds of photos or just enjoy absorbing the views with your eyes, on this remarkable adventure you’ll discover a host of wonders in one of the world’s last wildernesses. Here, at the very end of the American continent, lies a visual and sensual treat for the photographer and explorer alike. Patagonia is a dazzling world of calving glaciers, rushing waterfalls, and towering Andean peaks thrusting skywards from the clearest of blue-green waters. There are night skies milky with bright stars and remote islands shrouded with sea mists. Wildlife abounds here, too: reclusive pumas and soaring condors are just some of the many highlights. It all makes for one of the most coveted hiking experiences in the world. Ciclismo Classico director, Lauren Hefferon, considers this to be the most beautiful and inspiring of the many places she has visited during 30 years of travel. We begin our journey in El Calafate, gateway to the drama of ice, mountain, and water of Los Glaciares National Park. You’ll see nature at its most energetic at the Perito Moreno Glacier, which surges bright-and-white into the aquamarine waters of Lago Argentino. 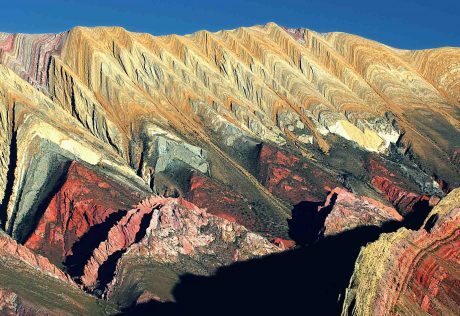 You’ll also hike among splintered Andean spires and discover the bizarre forms of ancient petrified forests. Our travel photo trek then takes us south to the spectacular Torres del Paine National Park. With its snowcapped mountain peaks, cascading waterfalls, remote glaciers and mirrored lakes, Torres del Paine really is the 8th Natural Wonder of the World. Here you’ll join our widlife safari to track Patagonia’s most elusive animals—the enigmatic Andean puma and the endangered South Andean deer. You’ll thread along classic trekking routes, crossing glaciers, lakes, and rivers to explore ancient woods and deep-cut fjords. Together, we’ll walk amidst wildlife–condors, guanacos, the Darwin fox, the elusive puma and learn about their behavior up-close from an expert naturalist. The camera skills you have absorbed will surely pay off with some truly spectacular photographs you will always treasure. On this journey of a lifetime, we guarantee that heart and mind, body and soul will be expanded and rejuvenated. What your lens has framed, and your eye has captured, will now be fixed in your mind—allowing the magic of this place to remain with you forever more. Stay in your own cozy geodesic dome set among the trees at the award-winning, world-renowned leader in sustainable tourism, EcoCamp Patagonia with stunning sunset views of the towers. Patagonia has a rich cultural history that is often overshadowed by its natural marvels. At the EcoCamp Patagonia, we will learn about Patagonia’s original inhabitants, nomadic tribes such as the Kaweskars and Yaghans, as well as the baqueano culture and the history of sheep farming in the region. Your Patagonia photo adventure begins with you being warmly welcomed at Puerto Natales Airport by our expert guides, who’ll transfer you to EcoCamp Patagonia for a welcome lunch and an orientation to this incredible nature oasis.b We’ll be staying at the EcoCamp for three full days of exploration and wildlife photography. Evenings are spent at the award-winning EcoCamp Patagonia in its sustainable, comfortable, geodesic Suite Domes, the region’s first fully sustainable accommodation south of the Amazon and the world’s first geodesic hotel room. All constructions at EcoCamp are built over raised platforms that allow wild animals to pass underneath the structures. Solar lamps light the walkways and domes at night. 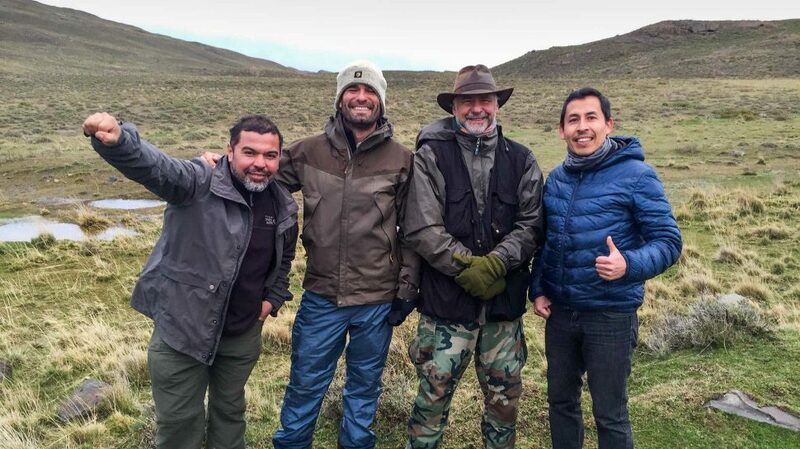 EcoCamp Patagonia operates an exclusive wildlife discovery program with wildlife and photography expert Diego Araya. The Patagonia Puma Tracking Photo Adventure is a one-of-a-kind nature exploration program focusing on Torres del Paine’s native wildlife, distinct ecosystems and spectacular photo opportunities across the Paine massif. 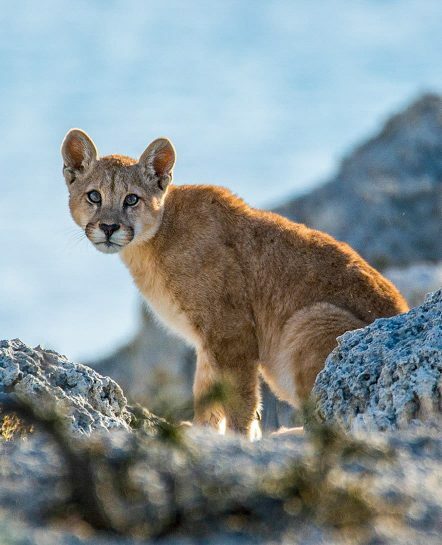 Diego takes you to the best-hidden spots to capture sightings of rare species, such as the endangered huemul and puma. This morning, we’ll experience the pink sunrise on Torres del Paine framed by lakes, twisting trees and wild horses in the foreground. After breakfast, we’ll begin our walk into Torres Del Paine National Park with our expert Puma tracker Diego. He’ll not only lead us to the puma, but he’ll teach us about many of the park’s special creatures and the fascinating interplay of their behaviors. While in search of the puma, we’ll experience and photograph some of the most dramatic and wild landscapes in the world. Today, we’ll have a full day of trekking. We’ll have many options to choose from based on your interest and ability, from an easy 3 to 5-mile walk to a challenging 8 to 13-mile trek. We’ll be transferred today to El Calafate. Our accommodations for the next four nights will be at Xelena Hotel & Suites. After checking in, we’ll visit Reserva Laguna Nimez, where you’ll get a chance to try out your wildlife photographic techniques on silvery grebe, black-faced ibis and flamingoes as they wade through its watery reeds. On the banks of the Lago Argentino (Argentine Lake), the hotel captures unforgettable images that will allow you to experience a personal fusion with a unique natural environment. Today, we’ll experience one of the world’s most spectacular sites: the Perito Moreno Glacier as it splits and splinters into the Argentino Lake. This 240-foot-high cliff of vivid blue ice is especially exciting for photographers, who will enjoy the array of colors and shapes created by this ancient ice. We’ll spend the morning walking on the pasarelas (“walkways”), which offer breathtaking views of the glacier. Our evening will conclude in El Calafate, where we’ll dine on fine Patagonian cuisine. We’ll take a boat ride to Estancia Cristina and from there, will use 4×4 vehicles that will take us to a lookout from where we’ll be able to see the Upsala Glacier. From there, we’ll take a spectacular hike down through the Cañadón de los Fósiles, an area where we can find abundant fossils and remains of the last marine ingression uncovered by glacial action. Starting from Puerto Argentino, we’ll navigate through the Témpanos Channel and enter the Seno Mayo del Argentinian Lake. When we reach Bahía Toro, we’ll have a guided walk through the Patagonian Andean Forest and arrive at the “Guindo Centenario” that has a trunk more than nine feet in diameter! We’ll then walk through the forest following a stream to a waterfall, where we’ll observe a formation of calcareous rocks whose magnificent walls measure 90 feet in height and 30 feet in width. Following a trail along a stream, we’ll reach the stone wall from where we’ll observe the hanging glaciers and enjoy a 360º-panoramic view of incredible landscapes that will leave you amazed. We’ll transfer you to El Calafate Airport to fly to Buenos Aires Airport. From there, you can either fly home or extend your stay in Bueno Aires.